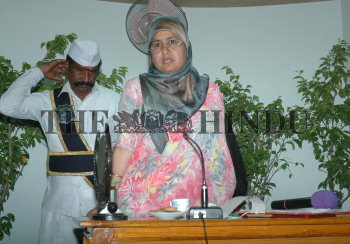 Caption : VIJAYAWADA (AP) 02/05/2007: Mayor Mallika Begum stands perplexed on the podium after CPI corporator Ijjada Appalanaidu made a comment on her scarf at a general body meeting of the Vijayawada Municipal Corporation on May 02, 2007. PHOTO: RAJU. V.